Well it was one of those annoying nights last night. Tired and sleepy at 10pm so I went to bed. Two and half hours later I was still lying there waiting to fall asleep. Grr. By 1am I decided since I was awake I may as well make use of the time so I got up and settled at my desk. I'm gonna be a bridesmaid for my friend's wedding but my dress, which previously had silver clips, needed some black ones instead. So I'd bought some hairclips to decorate in black attire to be suitable for the occasion. I quite like how they turned out. I wired a bunch of black beads together somewhat randomly and then sewed those onto a strip of velvet ribbon. 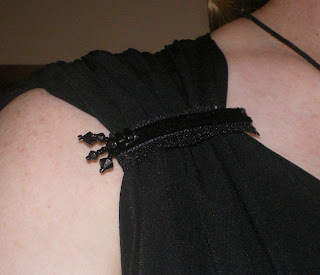 I then glued it onto some black lace and onto the clip, sewing the ends to the clip to make sure they stay there. It took me two hours to design and make them so I didn't get back to bed until 3am. Thankfully I had nothing I needed to get up early for today.